At Fast Assemblers we know you value your time, therefore we are here to do the tedious work of assembling your furniture for you. We assemble all sorts of furniture for your home and office. We also collect and deliver all kinds of furniture. Experienced and fully-insured experts will put together your flat pack furniture set in no time regardless of it’s size and brand. 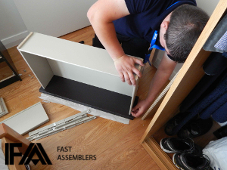 Fast Assemblers works with all large UK flat pack furniture brands. Our services cover all London areas. Quality and fast furniture assembly in London is our specialty and we are unmatched at ready-to-assemble (RTA) furniture assemblage. We have over 9 years of experience in knock-down furniture installation so you can rest assured we will put together even the biggest and most complex furniture such as wardrobes and beds. At Fast Assemblers we know that IKEA is the most popular ready-to-assemble furniture retailer. However, their service is often times slow and pricey. Therefore, we have put extra effort into gaining expertise in the assembling of all types of IKEA flat pack furniture and offering the optimal furniture assembly and delivery service. Our IKEA furniture assembly service in London covers all areas of the capital so you can easily book a service with us at any time no matter where you live. We have experienced and fully-insured assemblers at our disposal. They will bring all the tools and materials they need to complete your order. All you need to do is make sure there is enough space for them to put your furniture together. Call us at 020 3746 1134 and book your furniture collection, delivery and assembly today. Our polite customer service team will be happy to inform you about our services in detail. When booking, please make sure to mention any specific details such as fitting a big wardrobe in a narrow room or any special furniture mechanisms, so we can make sure we have the right tools prepared. Bedroom furniture such as beds, wardrobes, bedside tables, chest of drawers and more. Living Room furniture such as sofas and armchairs, side tables and coffee tables, TV stands and cabinets. Children’s room furniture such as wardrobes, cot beds, chairs, storage furniture. Kitchen furniture such as dining tables and chairs, free standing kitchens, benches. *For your information, our service doesn't include domestic or office items that are not furniture related. Call Your Flat Pack Furniture Installation Professionals Today! Fast Assemblers is well-accustomed to all major furniture manufacturers such as: IKEA, Aspace, B&Q, Dwell, Mamas & Papas, Habitat, John Lewis, Furniture 123, Heals, Argos, Peter Jones and more. Call us for a free quote and any additional information you might require. Let us do the work for you, simply call 020 3746 1134 or use our online booking form or chat. Your furniture will be ready to use sooner than you thought!